Save Orange County would like to express our deep appreciation to the community for the support you have shown us this year! From signing our petitions, voting for our recommended political candidates, and contributing to the citizens fighting Orange County over urban sprawl in our rural area, you have been amazing! We cannot thank you enough. 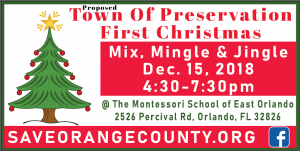 To honor you, we would like you to mark your calendar for Saturday, December 15 and join us for the (proposed) Town of Preservation First Christmas Mix, Mingle and Jingle!!! We will meet at the Montessori School of East Orlando, 2526, Percival Road, Orlando 32826. Gates will open at 4:30. There will be a short town hall at 5:00 to update making the (proposed) Town of Preservation a reality. At 6:00 PM there will be a family-friendly movie. To make this a big success for the community, we would like to have sponsors to help defray the cost of this event. If you can help, please send a note to [email protected]. Please help us with our fight to save rural living in Orange County, Florida.